Begin with the analysis of site conditions for path of sun through the sky and the seasons, summer breezes to exploit, winter winds to deflect, views to appreciate, water to hear and watch. Listen to clients to understand living needs, develop design concept that ties everything together and is visually beautiful, with a sense of fun. As the architect Vitruvius said, "commodity, firmness, and delight"
Start design with the envelope and passive systems, working with natural elements before planning active systems. Design to sustain people as well as planet. Consider the idea of passive survivability – how the building will function without any external energy inputs. Systems: Tight, highly insulated envelope with a centrally located thermal mass to collect thermal gain from sunlight and woodstove/masonry heater to release at night. Southern windows for winter heat gain with properly sized sun shading. Operable windows placed to promote cooling air flow through house in the summer. South facing roof slope for solar systems. Screen rooms to expand summer living space and provide summer shading. Think about materials in several senses- local harvest, natural, salvaged/recycled, embodied energy of production, durability, beauty, indoor air quality. Use materials based on their inherent qualities. 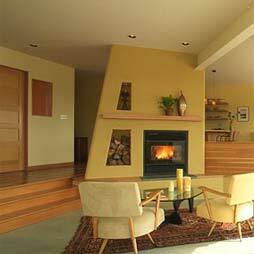 Minimize energy requirements for heating, lighting, etc. before pursuing energy production systems. Choose low-flow plumbing fixtures, native plants for landscaping. LEED for Homes, Vermont Builds Greener and Living Building Challenge are useful frameworks for discussion and planning.